Facebook has been very good to the city-building genre. Every day millions of people wake up, log in and click away the day placing buildings, upgrading facilities and incessantly bugging their friends for help in titles like Zynga's CityVille or Game Insight's My Country. 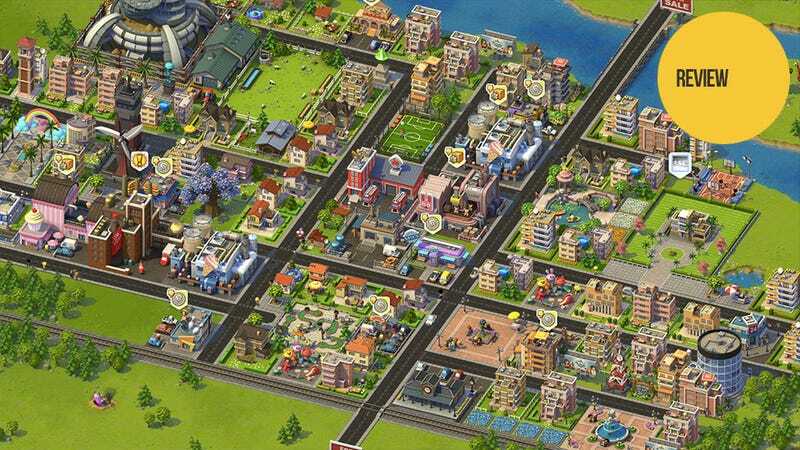 Now the legendary franchise that inspired these games has come to Facebook — SimCity Social is here to show them all how it's done. How it's done seems to involve sticking as closely to the formula established by those other games as possible. SimCity Social brings the original city-building video game to Facebook, though fans will be hard-pressed to find any trace of the depth and complexity of the popular PC series here. Players place businesses, factories, houses and various attractions - their expansionist ambitions kept in check by an energy meter that slowly refills over time. Tasks appear on the right side of the screen, requiring the player to build certain structures, collect special items or perform specific actions in exchange for an experience point and monetary reward. They'll gain levels, unlocking new buildings and decorations as well as new challenges. They'll do this forever. WHY: If you're going to play a city-builder on Facebook, this is the most engaging of the lot. What I played: Played on-and-off since launch, making friends and foes, building up my city, and reaching level 14. Was gifted 500 diamonds (roughly $60 worth) to advance projects, burned through that in three days. Strategically placing decorations and enhancements around houses to up their population. Being able to make enemies of my friends and friends of my enemies. The enemy of my enemy is, most likely, also my enemy. It feels like every other big-name Facebook game. The Facebook free-to-play friends-needed wall hits far too early in the game. This is the same basic formula established not only in games like CityVille, but in just about every game on Facebook that's enjoyed a large degree of commercial success. It's a formula that works. It works so well that innovation suffers. Upon first launching SimCity Social the similarities between this game and Zynga's popular offering are staggering. It looks like CityVille. It plays, initially, like CityVille. It even uses some of the same icons — experience points are stars, energy is lightning bolts, supplies are crates. To someone that's played with games in the SimCity series since 1989, it's depressing to see a game with that name trying so hard to be something else. Facebook game development is a unique business, where 'borrowing' concepts, gameplay and design elements from other titles is common practice; I get that. I used to play a game called Pet Society, developed by Playfish, the concept of which was taken by Zynga and used to create PetVille, ultimately a more successful game. So when Playfish takes a stab at CityVille I'm not going to cry foul; it's just how things work on Facebook. I just wish the SimCity brand hadn't gotten involved. There are fresh ideas here, though nothing quite as deep as the systems established in the big boy SimCity titles. For starters, the game allows friends to establish sister cities or rival cities, which enables some entertaining cross-border acts of charity or benign sabotage. By visiting other players' creations and either wreaking havoc or joy the player can decrease or increase their relationship level, unlocking new buildings and gathering special items used to enhance existing structures. It also unlocks cutesy gifts you can bestow upon your friends and rivals — a flock of birds covering their city in droppings, for instance. These interactions are quite endearing, at least until the fourth or fifth time you see them. Then the friendship / rivalry system devolves into simply another means to gather resources. What doesn't grow stale, however, is the innovative combo system for building your town's population. Unlike other city-building social sims, SimCity only has one housing unit, capable of housing a base number of residents. Increasing that number is done by placing attractions and decorations in your town. Each of these has a radius that increases the population number of homes in the area, which then morph into larger dwellings. Upgrading attractions increases the number even further. It's a sort of strategic combo system, entertaining enough to distract players from the fact that they're caught in an endless cycle of earning enough residents to expand their city, buying new land, and starting the whole process over again. It's also something to keep players occupied when they start having to wait for friends to respond to help requests, something they'll come across within 10-15 minutes of starting the game. SimCity Social is a cute and capable social city-builder. It's also a shameless attempt to capitalize on the success of Zynga's wildly popular CityVille, slapping a powerful name on a game that could never live up to its legacy. If you're in the market for a light and frilly city simulator, this is a good choice. If you want something deeper, your time will soon come.